…we had the opportunity to watch the audience fill in, witness anxious news reporters parade around, and get views of snazzy Texan attire. 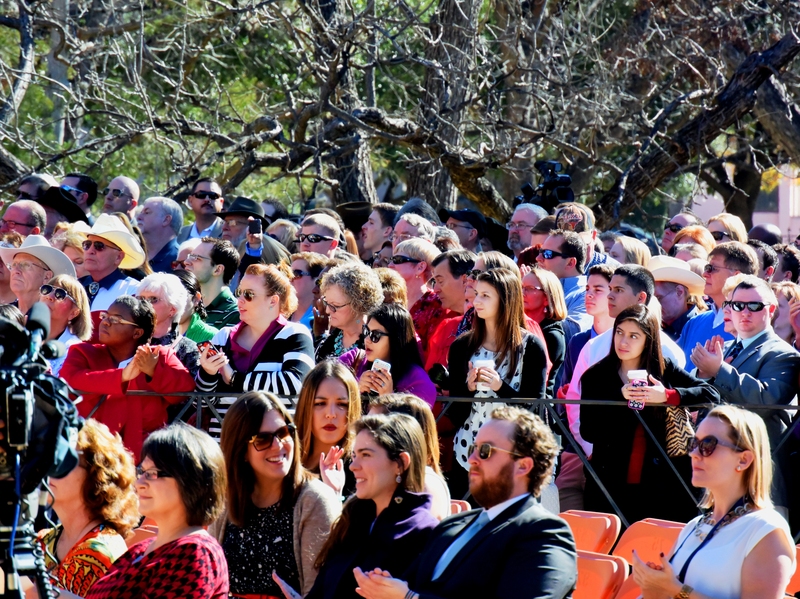 The festivities helped put us in the political spirit, with an F-16 flyover, the UT band playing patriotic songs, and a choir performing Texas-themed music. 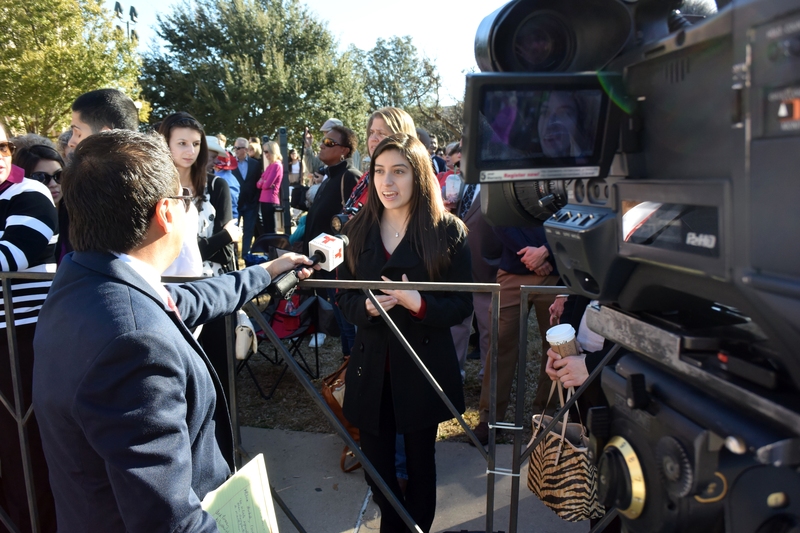 Karla Rosales, one of our freshmen members, was also interviewed for television! We watched as Dan Patrick and his wife strutted under the swords and across the stage, to a solid round of applause. 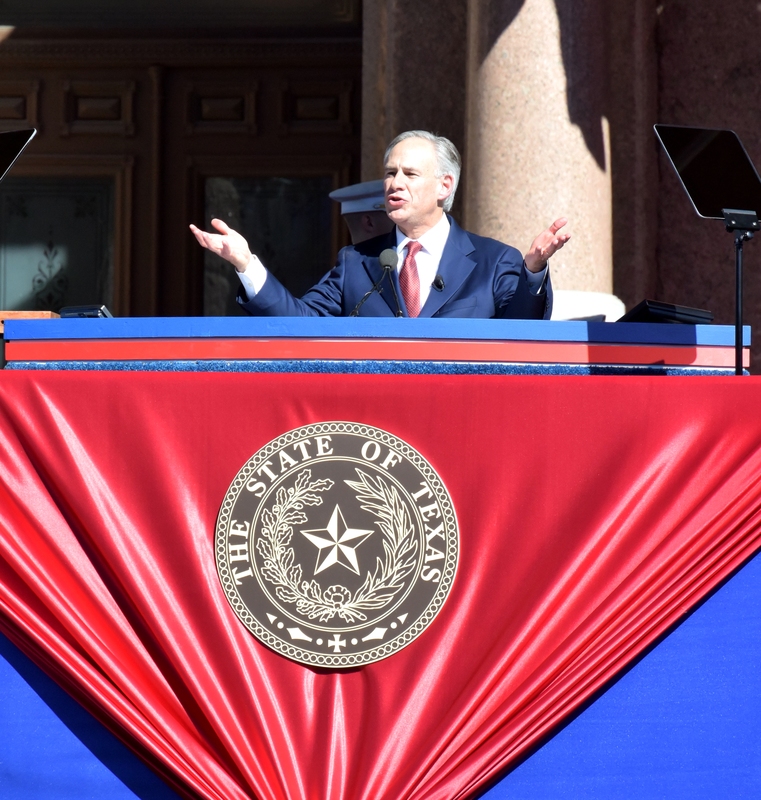 Governor-elect Greg Abbot and his family, however, received resounding applause, and the crowd—and the candidates—were ready. 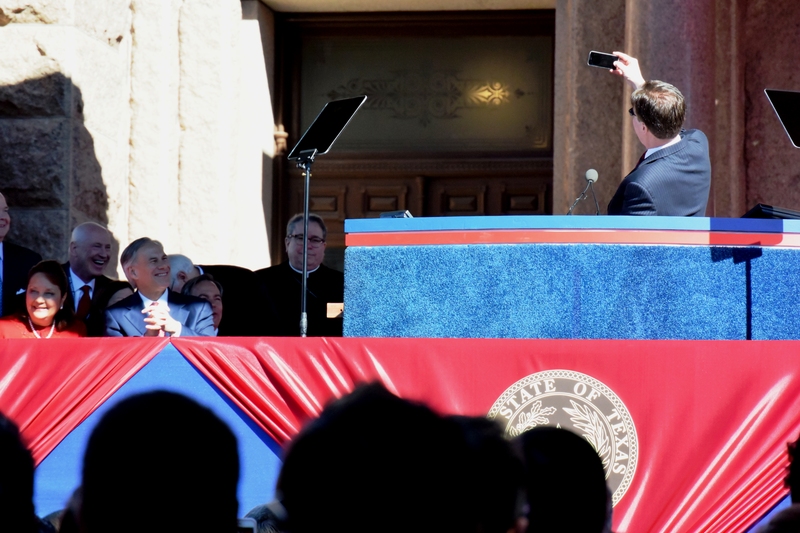 Governor Abbot’s inaugural speech was preceded by a 21-cannon salute, and the cannons had a loud, percussive effect. Our cameras shook. Abbott focused on his family and inclusion, stating that “Family everything,” and congratulating his wife on being the first Latina First Lady. 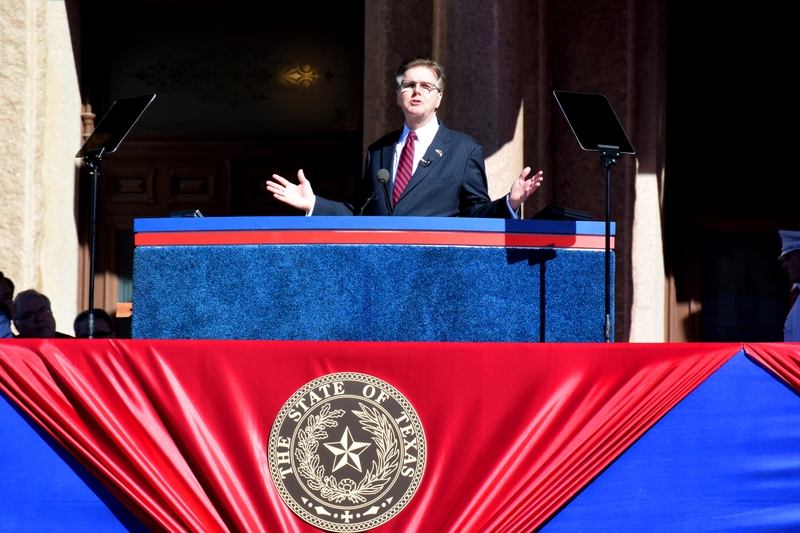 Abbott discussed his injuries, which resulted from an accident some thirty years ago, and gave thanks go God and the upward-mobility culture of Texas for his ability to rise to Governor. The inauguration was followed by a BBQ on the front lawn. Being a Texas BBQ, it was big—with helpings for 17,000. We ate picnic style in front of our state’s capitol building—what a tale for our kids one day. After enjoying the Inaugural Barbecue lunch, we headed into the Capitol building for a quick tour. Awed by the architecture of the building, we noted how intricate many of the details were, such as the door hinges and the ornate wooden molding. We traveled up one of the historic staircases to the second floor to enter the House of Representatives and then the Senate. Since the legislature was not in session today due to the Governor’s Inauguration, visitors were able to admire the chambers. We also searched among the Governor’s portraits in the rotunda, finding our favorites (Sam Houston, of course!). We also visited the courtroom where the Texas Supreme Court met until 1959 when the Supreme Court moved to a building of its own near the capitol. 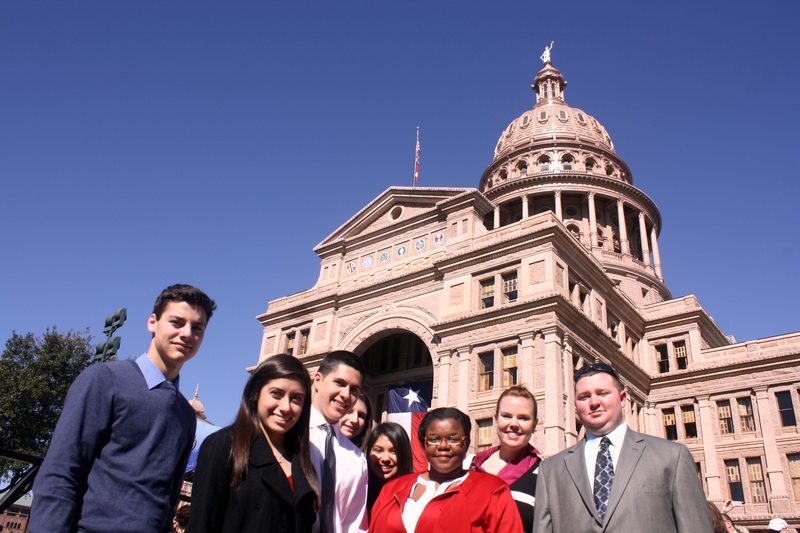 We took the opportunity of conveniently being at the Capitol during legislative session to visit some of the legislative interns from Sam Houston. 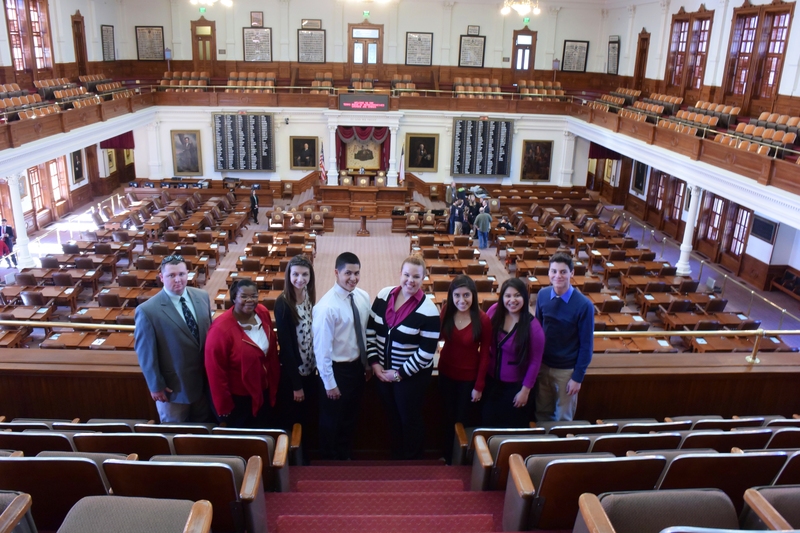 We visited the office of the second-longest serving member of the Texas legislature (Rep. Senfronia Thompson), where Jessica Rodriguez is interning. 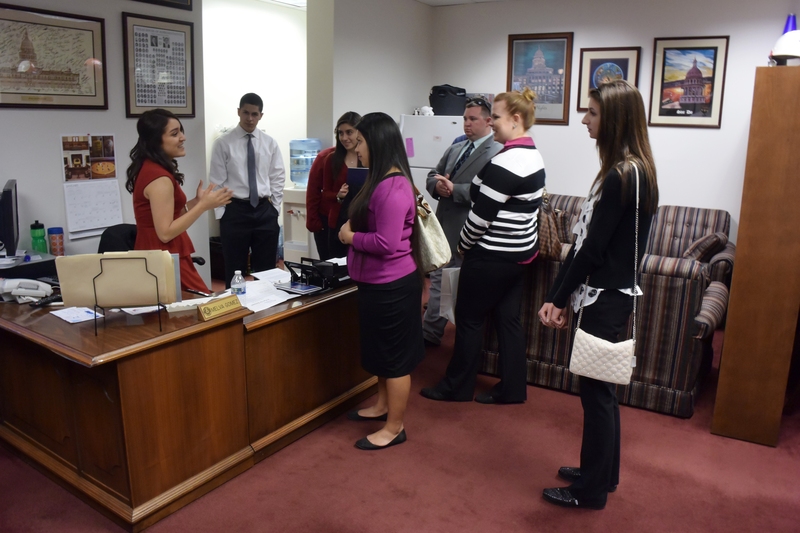 We also visited Lexi Gonzales in Representative Armando “Mando” Martinez’s office, and stopped by to Melva Gomez and Sadie McLaughlin in Representative John Otto’s office. We also stopped by to see Ariel Traub, but she was hobnobbing at the Inaugural Parade, but we were fortunate to get a tour of the office by Senator Charles Schwertner himself! 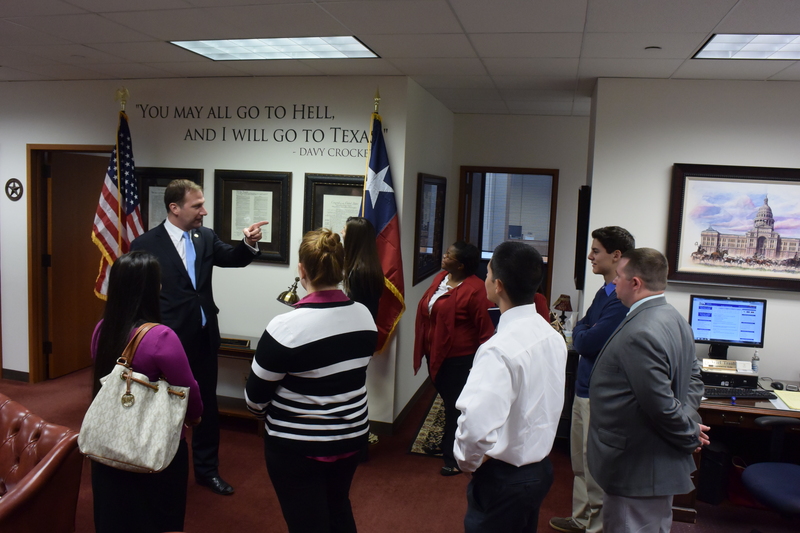 Very personable and friendly, Senator Schwertner was a great person to end our tour of the Texas Capitol and such an awe-inspiring day. 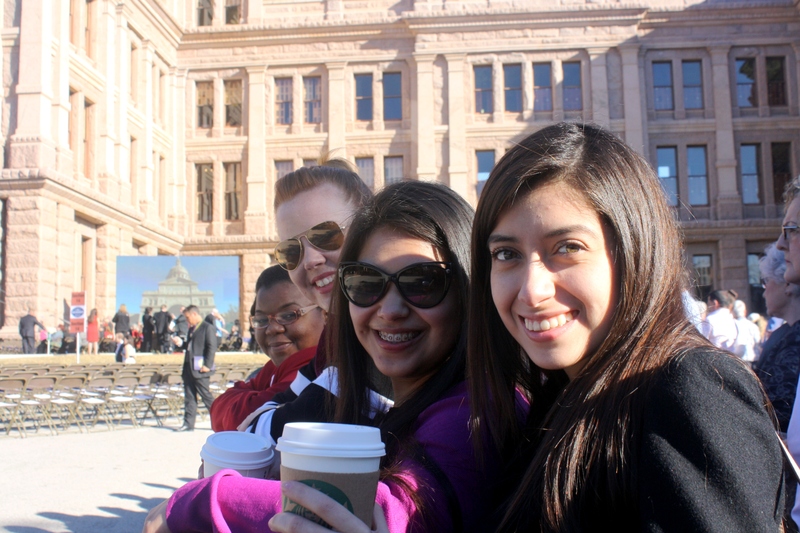 We left the Capitol, sadly, to head back to Sam Houston and Huntsville. On the way out of town we had the chance to stop at Quack’s 43rd Street Bakery. There we re-caffeinated for the drive home and enjoyed some delicious treats, such as their Raspberry Tart and Ginger Crinkle cookies. We then embarked on the three-hour drive home, reminiscing about our fast-paced trip to the Capitol and looking forward to our chances of maybe representing Sam Houston as interns on the hill one day soon.